Table and Chair Furniture Set are made of steel frame and PE Wicker. PE wicker is more resistant to sun, rain, heat, better than traditional wicker material. Rattan OurDoor Furniture includes 2 single sofas, 1 loveseat sofa and 1 coffee table. 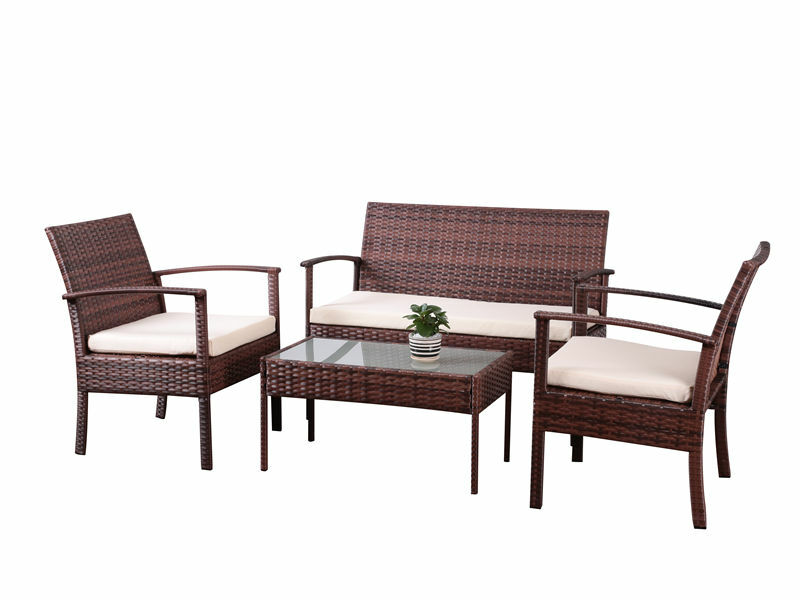 The wicker set is modern look and space saving. Compact design is perfect for a small deck, patio, balconies, terrace, apartment, breakfast nooks or pool side. Patio Coffee Set comes with soft sponge cushiones. It will bring you and your guest relax and comfort. And it is very easy to take the sponge out from the zippered cushiones. Coffee table comes with tempered glass, if you put any tee or coffee on it, wipe it and clean again. Looking for ideal Patio Coffee Set Manufacturer & supplier ? We have a wide selection at great prices to help you get creative. All the Table and Chair Furniture Set are quality guaranteed. We are China Origin Factory of Rattan OurDoor Furniture. If you have any question, please feel free to contact us.